Bamboo – Just Don’t Plant It! 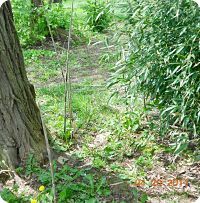 Recently, I have investigated two complaints from residents who are concerned that bamboo planted by a neighbor is spreading into their yard or HVL greenspaces. Unfortunately, there is no HVL rule prohibiting the planting of bamboo, but as your Natural Resources Coordinator, I strongly discourage it. Much of the bamboo sold at local nurseries and big box stores is non-native and VERY invasive. It spreads via rhizomes that extend outwards from the main clump about 12” underground. Mature running bamboo usually spreads 3-5 feet per year but can spread up to 15 feet! While you may like the idea of having a quick-growing privacy screen, planting running bamboo is one of the most un-neighborly things you can do. You cannot contain running bamboo on your own property and you place a burden on your unsuspecting neighbors to control it. To control bamboo, one has to mow down shoots that appear in a lawn or manually cut shoots that appear in wooded areas (if you can spot them when they are small). Once the shoot is cut off, the underground rhizome must be uprooted and cut back at the main clump. Since you will doubtless miss much of the root system, you must continually watch for resprouting and spray the new invaders with glyphosate. Don’t believe the claims that metal hedging barriers will work given all the rocks in our local clay soil. Plant this instead – If you want to plant a privacy screen, I suggest a native shrub like bottlebrush buckeye (Aesculus parviflora) or red buckeye (A. pavia). These grow more slowly, so you will need to be patient, but they also have the benefit of attracting pollinators and occasionally developing nuts.